A surprising analysis suggests the ResponsibleOhio legalization initiative could come up short on signatures, Guam releases medical marijuana program draft regulations, Obama visits a federal prison, Ohio's governor okays naloxone over-the-counter, and more. Ohio Legalization Initiative Could Fall Short on Signatures, But Will Fight If It Does. Columbus's 10 TV is reporting that its analysis of signatures gathered to put the ResponsibleOhio legalization initiative on the November ballot shows the initiative coming up 48,000 valid voter signatures short. That would be truly surprising, given that the group turned in 700,000 raw signatures and it only needs 305,000 valid ones to qualify. The group told 10 TV, however, that it could still collect signatures during a 10-day review period and that it could file legal challenges on signatures that were invalidated. Michigan Democrat Will Introduce Legalization Bill. State Sen. Jeff Irwin (D-Ann Arbor) said today that support for legalization has reached critical mass and that he will introduce a bill to do just that. "You've got people on the left who are saying that people should not be having their lives ruined over something like marijuana and you've got people on the right who are saying marijuana prohibition and the war on drugs is the granddaddy of all big government programs," said Irwin. "It makes sense from a public safety and public health perspective to bring that activity into the regulated space where we can make sure that consumers are protected. And we can also take the hundreds of millions of dollars we're spending on prosecuting marijuana offenders and direct those resources towards real criminals with real victims." There are also at least three groups working on legalization initiatives. Guam Releases Medical Marijuana Draft Regulations. The Guam Department of Public Health and Social Services has released draft rules for the island territory's medical marijuana program. Guamanians voted to allow medical marijuana in last November's elections. The rules must be approved by the legislature. Click on the link to read the draft rules. Ohio Governor Signs Emergency Bill to Increase Opiate Overdose Reversal Drug Access. Gov. John Kasich (R) Thursday signed into law a bill that will make the overdose reversal drug naloxone available over the counter. This is the third year in a row Kasich has signed a naloxone bill, each one more expansive than the one before. Two years ago, he authorized a pilot program for naloxone and last year, he signed a bill allowing friends and family members of drug users to carry the drug. North Carolina Bill to Ban N-Bomb Heads to Governor's Desk. The General Assembly Thursday approved House Bill 341, which would classify the synthetic psychedelic NBOMe, commonly known as N-Bomb, as an illegal controlled substance. The bill now heads to the desk of Gov. Pat McCroy (R). If he signs it, N-Bomb and its derivatives will become Schedule I controlled substances. 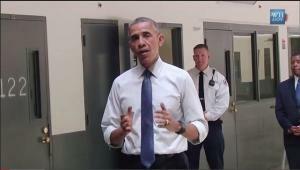 Obama Visits Federal Prison, Calls for Lesser Sentences for Drug Crimes. Wrapping up a week heavy on criminal justice, President Obama Thursday visited the federal prison in El Reno, Oklahoma, becoming the first sitting president to visit a federal prison. While there, he met with six drug prisoners and called for lesser sentences for drug offenses. Contact the white house and congress -- tell them you want them to take marijuana off of schedule 1, immediately. Not schedule II. De-scheduled! Not re-scheduled. Re-scheduled would just mean that doctors can prescribe it in its sanitized form for "certain conditions". To hell with that claptrap! You don't need any reason to consume alcohol, tobacco or caffeine! It belongs in the same category as those substances!